After recovering from the disappointment of my robe a l’anglaise being too small, I busied myself with making a caraco jacket. Like my robe a l’anglaise, this jacket was also made from a curtain I had found at a second-hand shop. 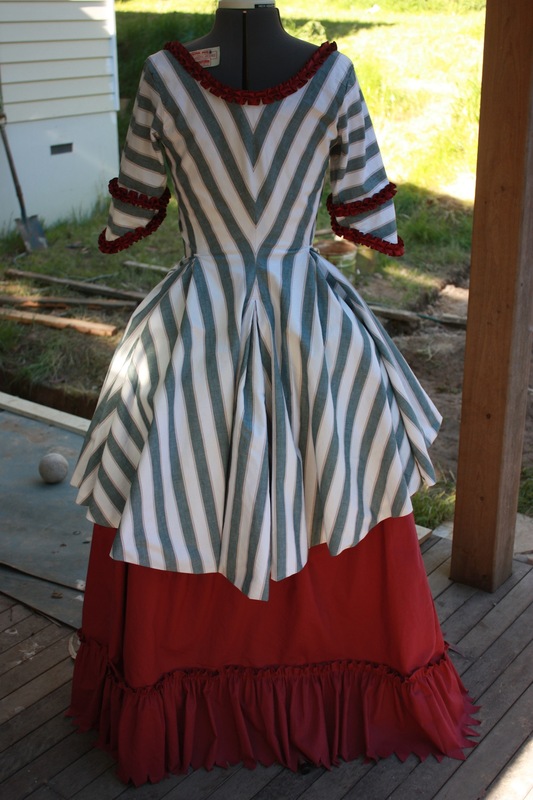 It had been in my stash for a while and, whilst I loved the grey stripes, I was unsure of how to use it because there was not enough material to make a full gown. 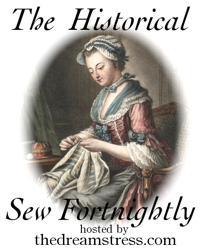 That is when I had the idea of making a shorter 18th century jacket, commonly used for daywear. A matching caraco jacket and petticoat (c.1770-1780), from The Victoria and Albert Museum. 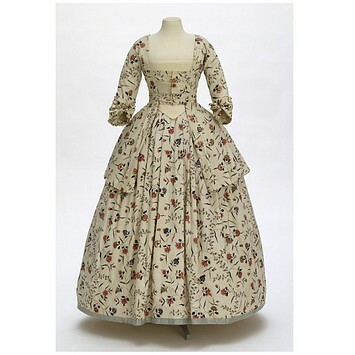 After doing a bit of research, I found several useful patterns in Janet Arnold’s Patterns of Fashion, which gave me a good idea of how much material I would need and how jackets like these were constructed during the eighteenth century. Caraco jackets were styled in the same way as a gown but the skirts were trimmed shorter, usually about mid-thigh length. Other types of jackets were trimmed even shorter than this. 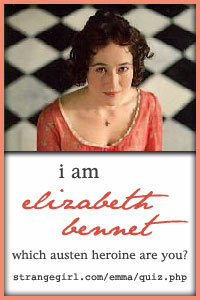 The jacket was then worn over stays, panniers or a false rump, and usually a matching petticoat. Janet Arnold gives some basic directions for assembling a caraco jacket (c. 1775-1785) in her book. First, I completely unpicked the curtain and measured it before cutting it. I knew that I had to take into account that the pattern would need to be made bigger to fit me, and that I needed to match the obvious stripes in the material. Then I basically sewed together the centre back and side seams of the fabric and lining separately, and then sewed the two layers together around the neckline. Then I attached the sleeves, which I ended up deciding not to line. 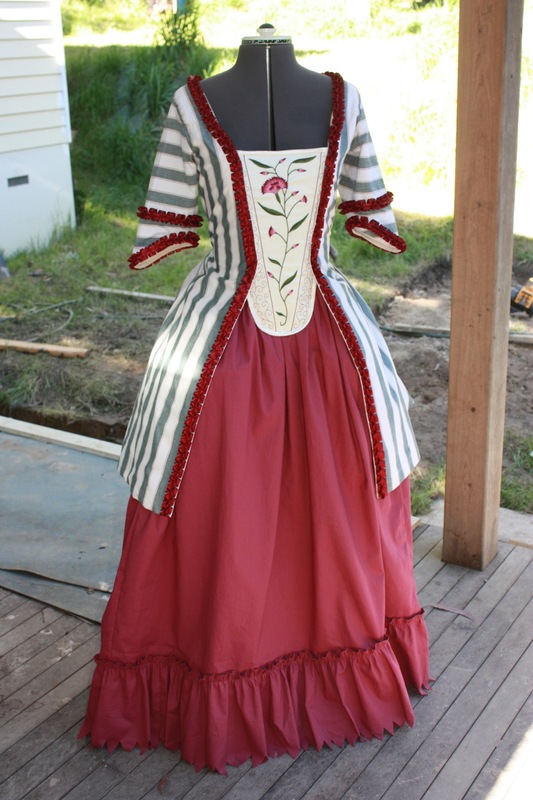 I deliberated on how to adjust the front so that I could include a stomacher, and all that was left to do was to sew a bar across the top of the back and side pleats, hem the bottom, and attach any trims. 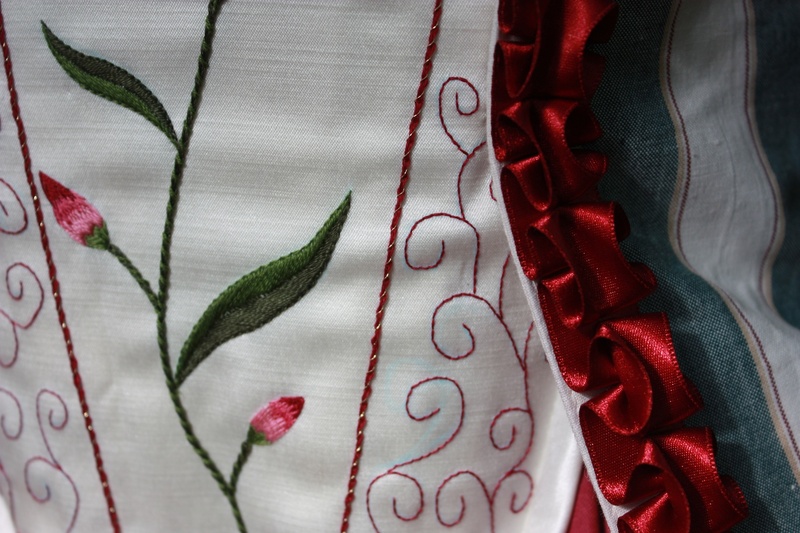 Here is the finished result, shown with the petticoat that was made to match my robe a l’anglaise, and the embroidered stomacher that I have just completed. For a remake of second-hand curtains, I think this outfit has turned out very nicely! Now, I just need to finish embroidering a pair of lawn ruffles to go around the sleeves. that is just so beautiful!!! love the look of the stripes from the back!!! clever girl! Thanks Bec. Matching the stripes was a little tricky, especially when I didnt have a lot of material to work with. But there is something very soothing about spending time matching stripes! It makes life feel ordered. very impressive recycling!! so clever Kel. Thank you. It is doubly satisfying to use something previously stashed away, isn’t it! I’m blown away – good job, Tea Cup Lady! Your outfit looks beautiful. Will you wear it at the 2013 JA Festival? No, probably not to JAFA 2013, as it is not Regency but more 18th Century. I will wear it to a ball this weekend though! Stunning Kelly! You are one talented lady! Great use of curtains! Hi., can you please tell me how to blow up the patterns from patterns of fashion by Janet Arnold. I do not know what percentage to do at kinkos, I read the book but I don’t understand it at all and trying so hard to find out the info., if there’s anything you could tell me will really appreciate. I got inch grid paper from my local fabric store (this stuff is 12 inch x 12 inch and is usually used for drawing up patchwork designs, so I did have to stick a lot of pages together), and I hand drew/copied the pattern pieces on the grid paper. It is a slow way to do it, but it is the only accurate way that I could think of. You could enlarge them on a photocopier, or maybe use an overhead projector to enlarge the images onto a wall and copy them from there, but I imagine that these methods might be a little less accurate. I presume kinkos would be a photocopy store? I am not sure of the exact percentage to enlarge the image by either, but the ratio is 1/8 inch : 1 inch. I suppose that, because you need the image to be 8 times bigger (because you want 1/8 inch to turn into 1 inch), that the percentage to enlarge would then be 800%. Hopefully your photocopy store would be able to do that! If there is anything else I can try and help with, just ask!